LOVE. That is what I have for this book. Just mountains and mountains of love. Kady Cross answered all of my prayers to the book gods by writing this book. Steampunk is one of my favorite genres ever, but it’s very neglected in the YA market. 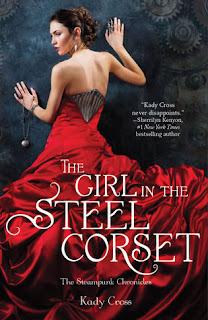 The Girl in the Steel Corset is just the novel to change that. This novel will most certainly help YA Steampunk realize its full potential! Set in a richly described steampunk London, the story starts off with a bang as we see Finley fighting her would-be-aggressor, a very rich and powerful—and dangerous—Lord Felix. This is where we first see her ‘dark side’, and I was immediately intrigued. Strong female heroines are the one thing that is an automatic like for me in a novel; but Finley redefined the word strong! She was both tough in character, and tough enough to take on even the biggest and strongest men. Of course, she’s frightened by this side of her that she isn’t able to control very well. It’s almost like a dual personality—very Dr. Jekkel and Mr. Hyde, which was actually mentioned in the novel. Finley must learn to unite the two halves of her before her dark side does something everyone will regret. When Finley runs away after beating Lord Felix to an unconscious pulp… she gets hit my none other than the Duke of Greythorne, Griffin King. Griffin is eighteen years old, orphaned three years prior, and he takes Finley back to his house unconscious so that he can be sure she’s unharmed. It’s there that Finley meets the ragtag team of misfits that all seem to have special abilities as well. There’s Sam, Griffin’s best friend, who is unusually strong… and not entirely human. Emily, a sweet young Irish girl who has much more ingenuity and intelligence than almost everyone else, and who has a strange affinity for all things mechanical. Jasper, an American cowboy that can move faster than you can blink. Griffin himself seems the most gifted of all, with the ability to tap into the Aether, the world of the dead which rests like a layer of unseen film over the living world. I thought Kady’s quirky cast of characters meshed well together, even those that didn’t get along very well, such as Sam and Finley. They each had a defining personality, and each had their time in the limelight. The novel was told in the perspectives of several of the main characters, which is a good and bad thing. It gives different little pieces of the puzzle and leads you to make your own conclusions, which is great, but at the same time, it takes longer to become attached to characters. But overall, the narration flowed well. I enjoyed Griffin’s voice the most, he just had a way of thinking that made me enjoy his parts. Romance wasn’t a main part in the novel, but the way has been paved for a romance in future books. Finley is definitely attracted to Griffin, ever the gentleman, but is also mighty attracted to Jack Dandy, the most notorious crime lord in all of England, and the polar opposite of Griffin. I personally loved both men, but I swayed a bit more towards Jack. Even though he wasn’t in the book too much compared to Griffin, he still had a distinct personality, not to mention his distinct style of talking. He spoke in an awesome Cockney accent, and honestly, Cockney accents are hot. I am so, so excited to read the next book, I can’t wait to see what happens! Even though the story ended off with a new problem for these friends to face, I can’t help but get the feeling that their old problems haven’t gone away like they think. I can’t wait! I give this novel 5 out of 5 stars. I got this book a couple of weeks ago and I can't wait to read it! I really haven't read any steampunk but I'm definitely willing to give it a try. Great review!